All silliness aside, I've made some pretty decent progress. Sonce Monday, I've made the scripting side of things significantly more powerful, and I also finished up the base monster ai. Any monster-specific ai quirks occur in scripts, which so far work pretty well. I had some bug issues, but they seem to be sorted out now. I added levelling on Tuesday, although it needs to be fleshed out more. 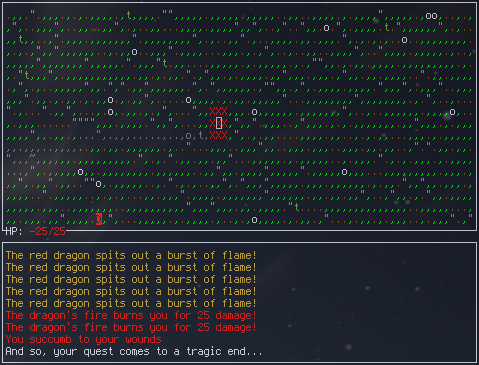 I finished the effect system today, which is why the dragons are basically walking tanks now. The effect system is designed to be very general and powerful, so that I can do quite a bit with it, such as altering terrain, spawning enemies, and more. The data-driven setup is really paying off now. I have 7 biomes and 12 creatures already!